The Zenith Pilot collection is made up of retro pilot's watches that are reminiscent of the Swiss manufacturer's long aeronautical tradition. Top models are rose gold chronographs with a tourbillon or an annual calendar. As its name suggests, the Zenith Pilot collection is comprised of pilot's watches. The luxury watch manufacturer from Le Locle near the French border began developing measuring instruments and watches for airplanes and pilots at the beginning of the 20th century. According to Zenith, the French aviator Louis Blériot wore one of their watches when he made the first flight across the English Channel in 1909. This early pilot's watch had many features of later models: a large crown, a black dial with large numerals, brightly illuminated indices and hands, and a rotatable bezel with an arrow-shaped marker. The design of current models is based on historical pilot's watches, making them quite retro and trendy. Zenith isn't the only Swiss manufacturer producing retro watches currently. Many are even re-introducing watches smaller than 40 mm, a move that follows the recent trend of shrinking watches. The Zenith Pilot Type 20 Extra Special 40 mm, which was introduced at Baselworld 2017, features an aged stainless steel case and falls in line with this trend as well. The watch has a grained dial and hands and numerals filled with a beige luminous material. The oversized crown is another feature that's reminiscent of the first Zenith pilot's watches. The Pilot Type 20 Extra Special 40 mm comes with a nubuck leather strap, either in wine red, blue, khaki, or mustard yellow. The first three strap colors come with a matching colored dial, while the mustard yellow version is paired with a slate gray dial. Top models in this collection are chronographs that feature a tourbillon or an annual calendar. The Pilot Type 20 Tourbillon is primarily available in 18-karat rose gold. Models set with diamonds are especially luxurious and cost over 100,000 euros. Without the jewels, these tourbillon watches cost around 50,000 euros. The Pilot Type 20 Annual Calendar is significantly less expensive; you only have to correct its calendar manually once each year at the end of February. You can purchase a stainless steel model for around 7,700 euros, while gold versions start at 13,000 euros. 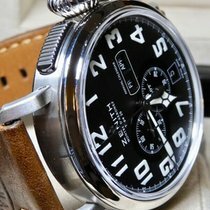 How much does a Zenith Pilot cost? A pre-owned vintage Zenith Pilot only costs around 700 euros. You should plan on spending a bit more on a newer retro watch. A Pilot Type 20 Extra Special in very good condition costs around 3,300 euros. A new model, on the other hand, will cost you around 3,700 euros. This classic pilot's watch is 45 mm in diameter, made of stainless steel, and features a black dial with Arabic numerals as hour markers. Like the hands, they glow in the dark to make reading your watch at night easier. The three-hand watch is also available with a bronze case. Bronze watches like the Panerai Luminor Submersible 1950 3 Days Automatic Bronzo have been highly sought after by watch collectors for years. Since bronze develops a patina over time, each of these wristwatches becomes a unique piece. A new Zenith Pilot Type 20 Extra Special Bronze costs about 5,300 euros new. Like the three-hand variants, the retro-looking Pilot Type 20 Chronograph is available with a stainless steel or bronze case. Inside the 45-mm timepiece ticks the world-famous in-house caliber, the Zenith El Primero, which was also the first chronograph movement ever produced. The caliber has an unusually high balance frequency of 36,000 A/h, enabling it to time 1/10ths of seconds and making it one of the most precise chronograph movements in the world. This chronograph has a power reserve lasting 50 hours. Unlike most watches in the El Primero Chronomaster collection, the Pilot Type 20 Chronograph only features two subdials, one for the decentralized seconds and the other for the 30-minute counter. Many Chronomasters also have a 12-hour counter at six o'clock. A stainless steel Zenith pilot's chronograph costs around 5,500 euros when new. A new bronze variant costs around the same amount. One highlight is the Zenith Pilot Cronometro TIPO CP-2, an El Primero-powered chronograph limited to a run of 1,000 pieces. The design of the 43-mm wristwatch resembles that of the famous Cairelli watch from the 1960s. This was a military chronograph produced by Zenith which the Roman dealer A. Cairelli delivered to the Italian armed forces. At the time, the official name of the watch was Cronometro TIPO CP-2. Since the watch was produced in the pre-El Primero era, it's not powered by the legendary movement. Instead, it was powered by the Zenith 146 DP, which was based on Caliber 749 by Martel. Martel, a chronograph specialist, has been part of Zenith since the early 1960s. When creating the Cairelli, Zenith had to pay careful attention to the military's strict specifications. Seeing as multiple manufacturers were producing watches for the Italian military along with Zenith, such as Panerai, there are other pilot's chronographs which very closely resemble the Cronometro TIPO CP-2. One example is a military watch from Universal Genève, which also has two subdials, a rotatable bezel with a 60-minute scale, and a zero marker. The limited edition of the Zenith Pilot Cromonetro TIPO CP-2 costs around 5,500 euros when new. You have to pay significantly more for a rarer vintage model, as the prices range between 17,000 and 25,000 euros. If you're often flying and changing time zones, you already know the advantages of a GMT watch. This type of wristwatch displays a second time zone, usually via an additional hand and a 24-hour scale. The Zenith Pilot Type 20 GMT is one such watch; you can recognize its GMT hand by its red tip. 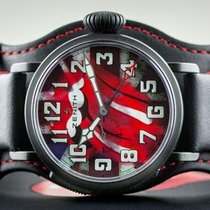 The design of this pilot's watch resembles that of the other Type 20 watches. One of the top GMT models is the 48-mm Pilot Montre d'Aéronef Typ 20 GMT 1903 with a black-coated titanium case. It also has Arabic numerals coated in Super-LumiNova. The caseback has an engraving featuring the Wright Brothers and their famous airplane. A wide, distressed leather bund-style strap keeps the watch on your wrist, and it's powered by the in-house caliber Elite 693. You can purchase a new timepiece for around 5,500 euros, while a pre-owned version costs 1,000 euros less.